You can choose between three turbocharged engines with this SUV. The 1.5L turbocharged gas engine can produce 170 hp with 203 lb.-ft. of torque and is coupled with a nine-speed automatic transmission. The available 1.6L turbocharged diesel engine is paired with a six-speed automatic transmission. This engine can reach 137 horsepower. With the 2.0L turbocharged gas engine, you get a nine-speed automatic transmission, and it can produce 252 horsepower. 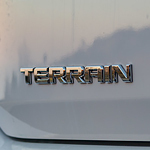 The Terrain also includes capability features that make trailering much easier. The 1.5L gas engine has a maximum trailering capacity of 1,500 pounds, and the 1.6L diesel engine also has a maximum trailering capacity of 1,500 pounds. The 2.0L gas engine has a maximum trailering capacity of 3,500 pounds.